What are the societal implications for a child in the concrete operational stage? As Piaget pointed out, by the time a child has reached the age of seven, he or she has mastered the fundamental rules of the physical world. This does not mean that children are now ready to leave their parents and live independently, but that they are ready to learn the basic skills necessary to function in their society. In the contemporary Western world, this means learning academic skills in school. In some tribal societies, boys of this age move out of their mother’s huts into the long house where the men and older boys stay. In medieval Europe, boys began their apprenticeships at age seven. Thus, it is no coincidence that Erikson referred to this period as the stage of Industry vs. Inferiority. Now that the child has grasped the basic rules of physical reality, he or she must learn the rudimentary rules of work. 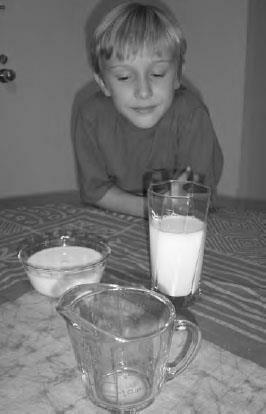 At age seven, Max is old enough to recognize that the tall, thin glass holds the same amount of milk as the short, wide bowl— in this case, one liquid cup. This understanding of conservation of volume is a hallmark of Piaget’s concrete operational stage (photo courtesy Roger Jänecke).